Ambleside Country Park, a picturesque Victorian 1880s fully renovated 3 bedroom country house that comfortably sleeps 7 guests. Top quality hotel quality linen, with warm comfortable feather & down doonas, plus additional blankets. Complete with a log burner fire in the Sitting room and wall mounted heaters in all rooms the property offers the perfect country getaway experience for your family or friends. Up to date bathroom/toilets with classic cast iron deep claw bath and over head shower. Equipped kitchen package comprising of chinaware, cookware, cutlery, glassware, dishwasher, washing machine, ironing board and iron. DVD, WI FI internet, Flat screen TV, Georgian antique furniture and comfortable sofas and arm chairs. Master Bedroom: 1 king size bed. Bedroom Two: 1 Queen size bed. Bedroom Three: 2 king-single beds (can be combined). Bedroom Three: 1 single sofa bed. Main Bathroom: Twin basins, Clawfoot bath, Shower, Toilet. Powder room: Wall hand basin, toilet. 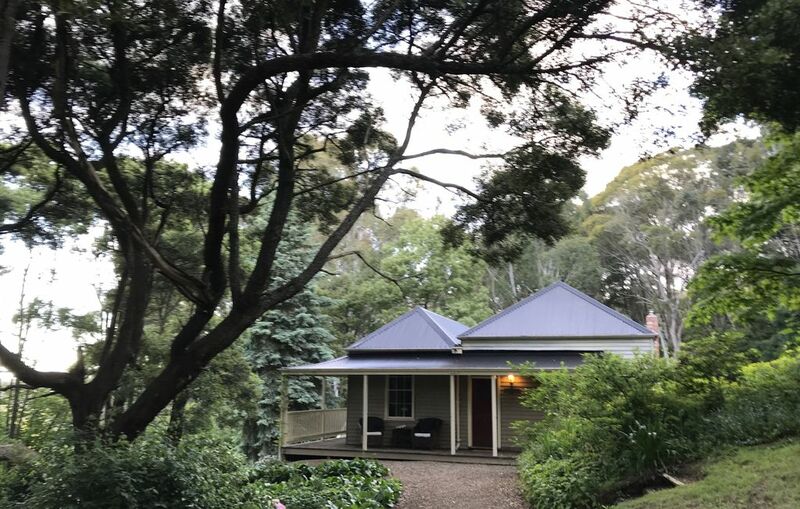 Situated in 2 acres of mixed Australian-English gardens; with heritage listed ancient trees, fruit orchard, gums, woodland and lawns, being private and tranquil but with neighbours nearby so not isolated. Native birds, (including kookaburras) wildlife (kangaroos, koalas) are in area as the property is situated near the Wombat State Forest. Children and Pet friendly, with secure gated zones on the verandah when required. Large playhouse with swings and slide for children. Ideal getaway for couples, singles and families, groups as Ambleside has an abundance of areas for everyone to find your own space. Local Blackwood township is only 4 minutes stroll, with the historic and longest running pub in Victoria "The Blackwood Hotel". Blackwood also has the superb and renowned "The Blackwood Merchant" a fully licensed cosmopolitan cafe and restaurant providing delicious food. The local general store stocks antique/bric-a-brac and a selection of grocery items. Local attractions: Mineral Springs, bush walks, nurseries with rare plants (Garden of St.Erth, Frogmore Gardens), wineries and spas. Local Blackwood tennis courts also nearby to the property. Location: 1 hr from Melbourne via Western Freeway, 10 minutes from Trentham, 30 minutes from Daylesford, Woodend, Kyneton. Blackwood is an early Victorian gold mining town. Beautiful gardens, bush walks and Mineral Springs. Wildlife such as wombats, kangaroos, native birds including kookaburras. With our professional and social lives based between Melbourne and Country Victoria, "Unique Residences" assists with managing a number of our properties. We welcome you and hope you enjoy your stay. Wall heaters are available for use at the property. Bedrooms are made up with Hotel quality linen, donnas and blankets. A wood burner fireplace is available for use at the property. Un limited WIFI internet is available at the property. Towels are provided for guests. A selection of DVD's are available at the property. A selection of books and magazines are at the property. A selection of board games are at the property. What a pleasure to stay in this large, comfortable and beautifully decorated home. The grounds are also gorgeous. Lots of thoughtful inclusions. I especially loved the claw foot bath, bliss. Look forward to a return visit as soon as we can. Our guest booked Ambleside Country Park for a weekend stay with family. Communication was prompt & the property was left clean and tidy as found. We have no hesitation recommending the guest to future hosts considering a booking. We enjoyed our stay, beautiful home and garden. Nothing to complain about, all delightful. Peaceful , comfortable and homely. Well equiped home with very amiable host. Would highly recommended as a perfect getaway. Carmel booked Ambleside Country Park for a few days break away with family & friends. Carmel communicated clearly throughout and the property was left clean and tidy as found. We have no hesitation in recommending Carmel to future hosts considering a booking. A warm and well appointed home. Beautiful surroundings. We had a relaxing stay. Thank you Vincent for welcoming us and also our pet. We will definitely recommend to friends and family. Ambleside is a beautifully presented home amongst lovely gardens. The house was fully equipped with essential items to make our stay comfortable and enjoyable. The fireplace was warming and we loved looking for and gathering firewood. The house was clean and tucked away amongst tall trees to provide privacy. The large decking provided comfortable and relaxing spots to watch the wildlife. We look forward to returning! Plain delightful! This iconic home is in a beautiful setting. And the hosts have your comfort covered - from the gorgeous linen to the A grade firewood.